Nurses who are on job hunting sometimes experience frustration when they don’t get the jobs they want. This can be true for nurses who are just entering the workforce as well as veteran nurses who have worked for years and would like to make a switch. What is keeping these qualified nurses from landing the jobs they want? Here are five things that may be holding them back. Recent graduates of nursing school may have a tough time finding the jobs they want because their schools don’t have an adequate placement program (or any program at all). Because they are new to the field, these graduates are often unsure of how to network or make connections, and they end up missing out on relevant jobs because they just don’t hear about them or have anyone pointing them in the right direction. As in any industry, it is expected that there will be enough people retiring to make room for newcomers to the field. In nursing, however, a recent report found that older nurses are delaying retirement, making vacancies for newer nurses harder to come by. Why are older nurses delaying retirement? The reasons seem mostly economic. Nurses, just like doctors, often have strong preferences for their specialties. For example, an ER nurse might find working on the Endocrinology ward boring; a geriatric nurse might feel uncomfortable working in pediatric nursing. These preferences are 100% legitimate, but with limited vacancies, they make it difficult for some nurses to attain the jobs they want. Because the field of nursing is so competitive, many great candidates are being overlooked simply because they haven’t presented themselves on paper in an appealing way. Nurses who have years of experience might have neglected to include all of the specific tasks they have done over the years; new nurses might make rookie resume mistakes that can be easily fixed by a professional resume writer. It sometimes happens that nurses are invited for interviews, they feel they aced it, and then, they never hear back from the hospital. These are classic cases of lack of follow-up; if a nurse would shoot off a quick email after her interview thanking the interviewer, it will go a long way. Additionally, if the potential employer gave a deadline for when they would let a nurse know whether she got the job, and the deadline passes, the nurse should definitely follow up. While it’s certainly the most pertinent thing on the nurse’s mind, administrators often have so much on their plates that they forget their own deadlines. 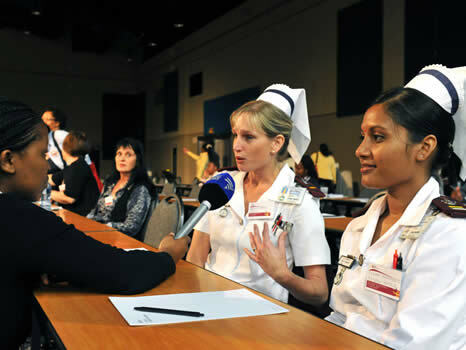 How Can Nurses Help Themselves? As you can see, sometimes not finding your dream job is due to lack of resources; other times, it’s just bad luck. If you are a nurse who is having trouble getting the job you want, consider networking as much as possible, sprucing up your resume, making sure to follow up with interviewers, and having an open mind about other specialties like home care.